Meat, produce, and local artisanal goods. Delivered to a pickup location near you. Registration is quick and easy: choose your box, pick-up location, and schedule. Organic & Local first, our products change with the season. Customize every order, and add artisan extras. Learn more about our family farm here. Choose a pickup location close to you and we'll bring your order there. Don't see your community here? Contact us about bringing our service to your town! "We're SO fortunate to be able to enjoy Happy Pig's incredible food! 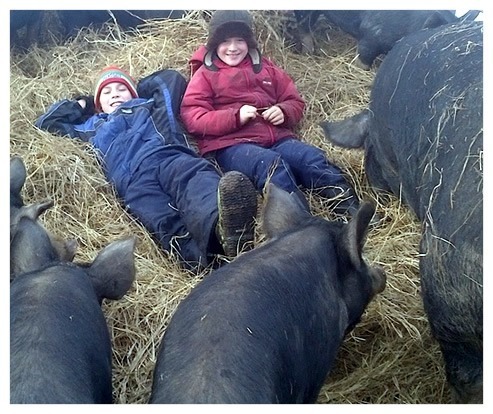 Local, ethical family farming right here in our community. Ridiculously yummy!" 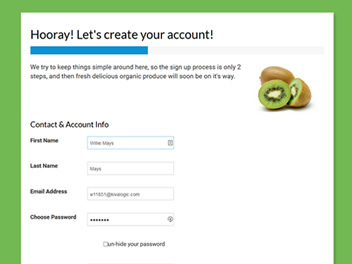 Happy Pig Farm’s organic grocery service is exceptional! I have found Paul and Marlene very flexible regarding grocery bag content as well as case size ordering. 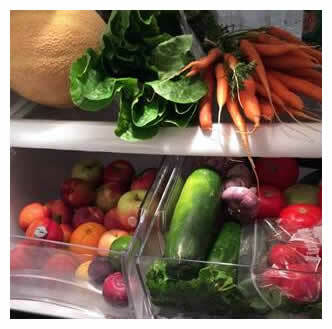 I have a large family and we eat ALOT of fresh fruit and vegetables. We ordered two family size bags weekly for a while. I was very happy with the variety and the quality. However, I found with doing large salads and cooking projects that I needed much larger quantities and specific ingredients. Marlene suggested case orders of what I needed and it has worked very well for my family. Organizing, sorting and delivering a weekly grocery order is a huge commitment and an invaluable service to our community. I really appreciate Paul, Marlene, Aidan and Connor’s efforts. Happy Pig Organic Food Bag is a great convenience in a busy work week. A big bag full of quality produce delivered with a smile. The value is good price point, ease of ordering, pre-paying monthly, quality add-on selection (bread, meat, eggs) and options for pick-up. A wonderful product from a wonder of a family. Thank goodness for the Happy Pig organic produce bags!! Every week we look forward to our delivery. It encourages me and my family to eat healthier, and try new things. 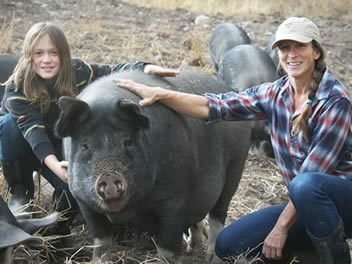 Happy pig organic is working hard to offer a service to NW BC! Healthy, good quality food is always delivered. We appreciate their willingness to take feedback from clients and strive to use it as they develop their business! Thank you. Happy Pig Organic Farm's Food Bag Service is the coolest way to get good food. I love that the bag can be customized and that it's delivered. Great service, great food, great price. The perfect size for just you, or some roomates who want to share produce. If in doubt, pick this one; it is an excellent starter and you can change your box size at any time if you decide you want more produce! Average 15lbs of fruit and vegetables. Small families, produce-conscious couples, or anyone who finds this nice happy-medium. Approximately 20lbs of fruit and veggies. Nothing but fruit! Perfect for on-the-go snacks, keeping your office breakroom stocked up, or just making sure you have lots of organic fruit in your kitchen. Focus is on BC or Canadian fruit when it is available. Veggies are here! All veggies for you, perfect for salads, vegetarians, juicing and more! Focus on BC and Canadian products when they are available. suitable for eight to ten 8oz glasses. This is a bag intended for folks who want to juice! Use this mixed bag as a base and you can make substitutions as you like. Extra's can be added using the shop.